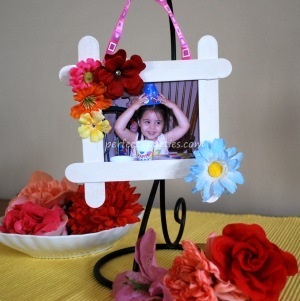 Photo Frames are a Great Birthday Party Idea. Print a picture of the birthday girl, party or the guest to send this home as a cute make and take. Here is a list of crafts on this page. Scroll down to read them all or use these links to quickly jump to it. 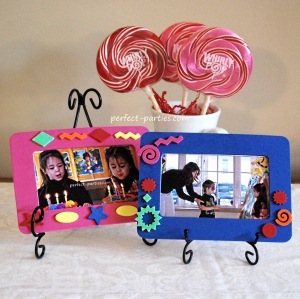 Make picture frames with Jumbo Sticks and send home a photo of the party. Take a quick group shot or individual pictures with the birthday girl. Select photo and use a 4 x 4 or smaller picture and print on photo paper or copy paper. Remember that there will need to be 1/4" minimum to adhere to back of the frame so crop carefully or leave a border. Pre assemble frames before the party. To assemble frames quickly and evenly: Draw a square or rectangle on a sheet of paper of the size of the photo you want to show. Remember to draw the square or rectangle at least a 1/4" smaller than the actual photo. Lay the vertical sticks on the square and then glue down the two horizontal pieces. Either paint ahead of time or let children paint. Let dry. Ceramcoat acrylic takes about 10-25 minutese to dry. Hot glue a magnet to the back or hot glue yarn or ribbon from the top to hang.(optional). Quick and Easy! 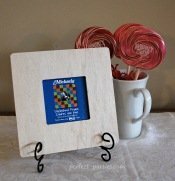 These photo frames can be found at Craft stores like Michaels for a $1.00. Low Temp Glue Gun or Fabri-tac are great for hard to stick item but require adult supervision. Select photo and print on photo paper or copy paper. If you are taking one at the party, have the program ready to resize it to fit the frame. Either paint ahead of time or let children paint. Let dry. Decide if there is time for it to dry. Insert picture into the frame.